Schedules and routines are so important for our little learners (and teachers too). Routines help students feel safe and secure because they know what is coming next and what is expected. Another helpful side effect of scheduling is that less problem behaviors occur when a schedule is consistently followed. Students learn the sequence of the day and can begin to predict and anticipate what will come next. Research tells us little learners NEED visual schedules and consistent routines. Our daily routine does not change often. However, it may be adjusted based on students’ needs, situations (fire drills, etc.) and classroom events. For example, sometimes students are so engaged in play with their peers that I will extend center time for five more minutes. Below you will see our preschool schedule. 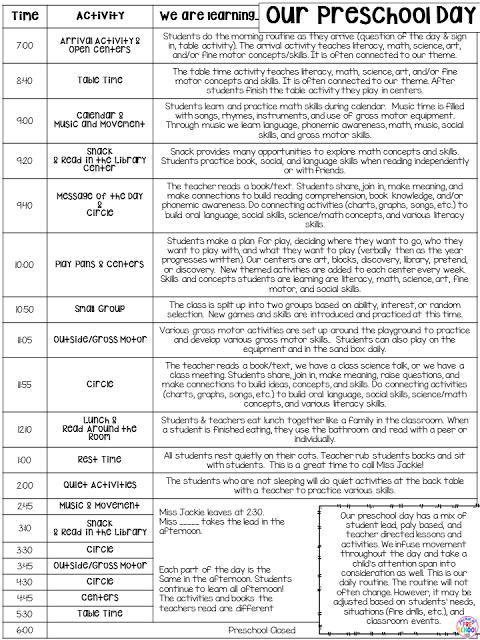 I made this handout for parents so they know what each part of our day looks like and what students are learning. I want them to know I embed learning into their day every chance I get! I keep a copy of “Our Preschool Day” on the parent board, and send it home in their folders at the beginning of the school year. I know this image is a bit blurry. It is my schedule for my half day preschool class. 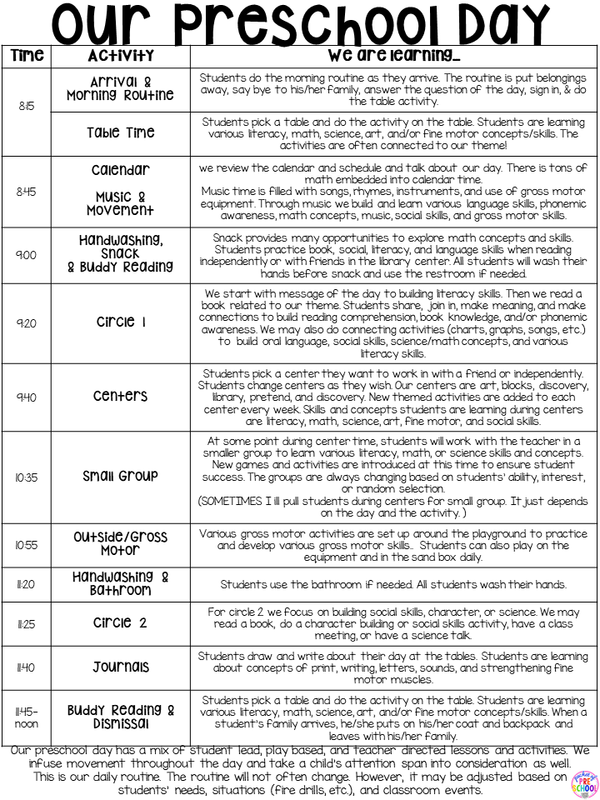 You can click the image to download a copy of my HALF DAY Preschool Schedule. This is my full day preschool schedule. It has been about the same for all 11 years that I taught full day. I have made little tweaks here and there, but this was ultimately the best schedule for my students and my school. To help students learn and organize their day, I post a visual schedule in my classroom. It is permanent, visual reminder students can use a reference as needed throughout the day. Every day during calendar time we review our visual schedule together as a class and discuss any changes we have in our day. Since I started the half day program, I use this black schedule pocket chart for my visual schedule. I made a blue square with an arrow that we can move to show what part of the day we are currently in. Before we review the visual schedule, we review the calendar. You can read all about our Linear Calendar HERE. I’m sure you will notice that students play in centers for large blocks of the day on both the full and half day schedules. Center time is a time when students can choose what center they want to go to and the activity they want to play. They decide who they want to play with or if they want to play independently. They choose when they want to change and move to a different center. It’s their time to make decisions, and they are empowered by the ability to choose. Our preschool day has a mix of student-led, play-based and teacher-directed lessons and activities. We infuse movement throughout the day, and take a child’s attention span into consideration as well. I usually do a teacher-directed activity then student-led activity. It’s also important to alternate between active and sit down activities. Little learners NEED to move and be active. Alternate between active activities (outside/gross motor, music and movement, centers) and sit down activities (circle, small group, journals). To help with transitions, I use as many visual supports for my little learners and slowly fade them as the year goes on. Fading the supports helps them develop independence. Five minutes before clean up, one student walks around with the “5 More Minutes” sign (visual cue) and tells (verbal cue) their peers that center time is almost over. This helps students mentally prepare for the transition. When it is clean-up time, the music helper turns on a “clean-up song” and students know what to do. Once they are finished cleaning up their activity, they go help a friend. We practice and teach clean-up at the beginning of the year and throughout the year as needed. Make sure the clean-up song has a fast tempo so students clean-up to the fast beat of the music. We have to teach students social skills and character building just like we teach them letters and numbers. The second circle time every day is just for teaching social skills and science. The group activities will be a social skills activity most of the time, especially in the first three months when students are learning routines. We will do fun, engaging activities from my Character Education pack! We will learn about Green and Red Choices, problem solving solutions, circle time rules and expectations, playground rules, how to calm down, all about our feelings, about families, about giving and being thankful. In the full day schedule, the second circle before lunch was mainly for character activities. Want to know more about our day and classroom? Check out these posts! Save time and purchase these Rainbow Visual Schedule Cards for your classroom. There are 86 different schedule cards included that are just right for early childhood classrooms! Grab Clean Up Routine Visuals and Supports to make clean up time a breeze for you and your students! Teach character and use visual supports! Grab my Character Education Bundle (aka social skills), and you will have everything you need for the entire year!